My research for the last 15 years has focused on interest group electioneering efforts in federal campaigns. The latest iteration of this work is to track the type of organizations involved in elections between 2000 and 2016. By type of organization, I mean the formal tax classifications of the various groups investing in congressional and presidential elections. Much has been made in recent years of super PACs (a group legally allowed to form starting in 2010) versus non-profit groups like 501c4s. Super PACs disclose donors, but c4s do not. c4s are often identified as “dark money” groups because of their limited public disclosure of donors, and many are worried (including my Senator, Angus King) about their presence in elections. But c4s are not “new” to politics and elections. Nor are 501c5s and c6s, which are labor and business groups who similarly do not release their donor lists to the public. So prevalent have such groups been in federal elections in the last 15 years? My colleagues at the Wesleyan Media Project, in collaboration with our friends at the Center for Responsive Politics, have begun the hard work of classifying groups into different types, with the goal of showing any trends over time. 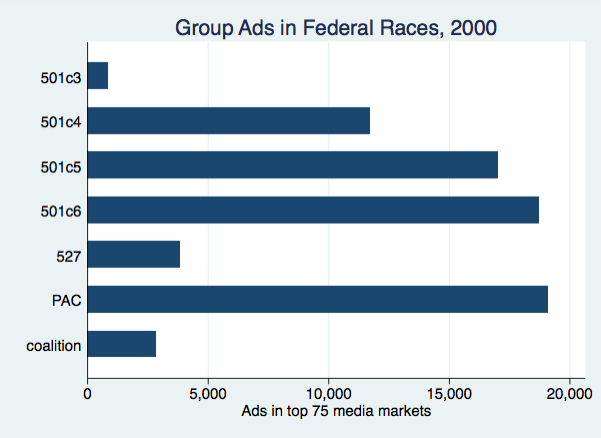 For starters, here is the breakdown of sponsor type in the federal elections of 2000, counting ads that mentioned a federal candidate and that aired in the top 75 media markets on broadcast stations. These include the now-famed “issue ads” that many debated were beyond the permissible reach of campaign finance laws. This is fun work, and we hope to produce a comprehensive report on this in the coming months.